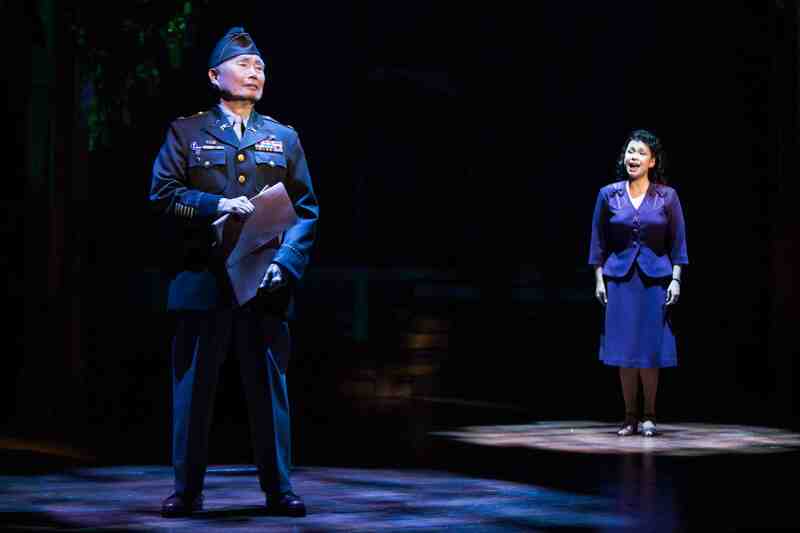 “Allegiance,” the first Japanese American musical on Broadway, at the Longacre Theatre, is closing Feb. 14. If you haven’t seen it yet, book your flight, reserve your seat, and make your way to New York through the snow and cold, because you will witness and be a part of history. You will also be thoroughly entertained and enlightened, as was the audience the night I went, over 75 percent non-Asian; laughing, crying, applauding, and standing up at the end during a resounding ovation for the cast, the production and the orchestra. It was remarkable to see all ages, generations of theatergoers, whose emotions were truly aligned with each of the main characters, as the play unfolded, the struggles of a simple farming family from Salinas, torn apart by the outbreak of World War II, basically stripped of their rights of U.S. citizenship, rounded up and sent hundreds of miles away from their homes by armed soldiers, only to find themselves behind the barbed-wire fences of a prison camp, in the middle of the deserts of America. “Allegiance,” with music and lyrics by Jay Kuo, book by Jay Kuo, Marc Acito and Lorenzo Thione, officially opened on Nov. 8, 2015, after a month of previews. The production stars George Takei, one of our Asian American icons, Lea Salonga, who truly made “Miss Saigon” into such a long running success on Broadway, and Telly Leung, a young, rising star of the Asian American community of actors and artists. Michael K. Lee, Greg Watanabe, Christopheren Nomura, and Katie Rose Clarke deliver powerful, standout performances. The supporting cast, filled with seasoned professionals, brings the intricate production design, complex choreography, and elaborate musical numbers and songs, together into an emotional roller-coaster of a ride through a part of Japanese American history still unknown to many, but needs to be remembered, preserved and passed on. The reviews for “Allegiance” have also been a roller-coaster ride for the production, from the cool, mixed opinions of the New York press, to a glowing Rex Reed stamp of approval, to the historically questionable from judgmental historians. All but one review that I could find mentions the importance of the story behind “Allegiance” – the internment of 120,000 Japanese and Japanese Americans during the hysteria-filled political climate of World War II. It is a part of U.S. history that continues to haunt those who lost their homes, or businesses, or loved ones, and serves as a lesson of civil and human rights today. The Asian Exclusion Act of 1924 limited immigration into the United States from Asia, but the Immigration Act of 1924, known as the Johnson-Reid Act, ended immigration from Japan and naturalization of Japanese immigrants until 1952. The Alien Land Law in 1920 outlawed the purchase of land by “aliens ineligible for citizenship.” This previous anti-Asian sentiment allowed for the Asiatic Exclusion League, the League of California cities, Earl Warren (attorney general of California, 1939-1943), Maj. Karl Bendetsen, U.S. Army (known as the architect of the Japanese American internment), Lt. Gen. John L. Dewitt of the Western Defense Command, U.S. Secretary of War Henry Stimson, and the FBI to work together and convince then President Franklin D. Roosevelt to sign Executive Order 9066 on Feb. 19, 1942, excluding Americans of Japanese ancestry from the West Coast, sending them into exile in the ten internment camps for the duration of World War II. Through the main character, the young and older Sam “Sammy” Kimura, “Allegiance” commemorates the thousands of Japanese Americans who served in the segregated units of the U.S. Army, the 100th Battalion/442nd Regimental Combat Team, the 522nd Field Artillery, the 1399th Combat Engineers and the Military Intelligence Service. The 100th/442nd RCT remains today as the most highly decorated unit in U.S. military history. And through his opposite, Frankie Suzuki, the play recognizes those who refused to accept the unjustness of their incarceration, bringing to life the courage of men like Gordon Hirabayashi, Min Yatsui and Fred Korematsu, three Japanese Americans who sued the United States for violation of their civil rights. But “Allegiance” is also historic because it now has a place above what has been almost a nonexistent Asian presence on Broadway: “Chu Chin Chow” (1917), Tyrone Power, Sr. in the title role; “Lute Song” (1946), Mary Martin in the leading young Asian woman role; “South Pacific” (1949), “The King and I” (1951), “Teahouse of the August Moon” (1953), and “Lovely Ladies, Kind Gentlemen” (1970), all with “Oriental” roles portrayed by Caucasian actors or filled with subservient or demeaning Asian characters. The Asian American Performers Action Coalition, an organization that has helped actors of color to overcome obstacles to bring more inclusive casting to New York City, reports that of the 3,530 roles cast on Broadway over the past five years, only 54 Asian Americans were cast. That’s 1.5 percent compared to 12 percent African American, 4.2 percent Latino, leaving over 80 percent going to Caucasian actors. And the organization says that this is an improvement from the previous five years. I highly recommend you be a part of history. Go see “Allegiance.” You will laugh, you will cry, you will applaud, and then you will stand up at the end to pledge your allegiance. Lane Nishikawa was the artistic director of the Asian American Theater Company in San Francisco for ten seasons. He served as co-artistic director of the Eureka Theater Company and resident director of the San Francisco Shakespeare Festival. He has toured his plays to over 75 cities across the U.S., Canada and Europe. He produced and directed the feature film “Only the Brave,” currently on Showtime. He is a member of the DGA, SAG/AFTRA, and AEA. Unfortunately many of us are stuck here in California with 80 degree weather and can’t get to beautiful New York by February. I hope a production will come to the West Coast so many more can enjoy this worthy and epic musical.